I couldn’t have asked for a better day. The forecast for noon, when I expected to be on the summit of Potash, was 12 degrees, 10mph winds from the northeast and absolutely clear. Knowing it would be clear and sunny I stopped at the EMS in North Conway and picked up some sunglasses. I typically don’t own sunglasses because I have one of those weird heads that no pair of glasses seem to fit. I don’t know, one ear is higher than the other or the bridge of my nose is crooked. Probably a result of inbreeding or something. Miracleously I found a pair that fit my face and I walked out of EMS with a smile while glancing up at the white shoulder of Mount Washington. I got to the logging road just past Passaconaway Campground on the Kancamangus and saw that the entrance was not plowed enough to safely park there. 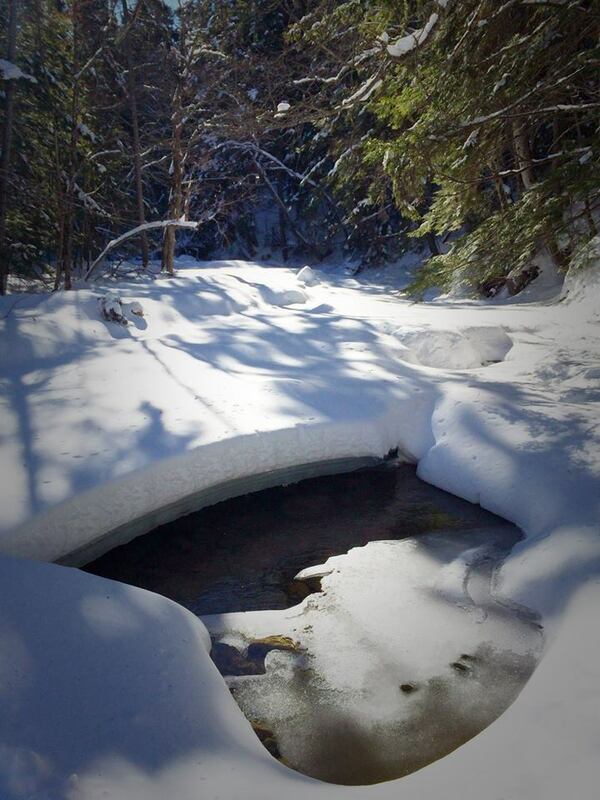 It’s suggested that you hike from the logging road to bypass the Downes Brook crossing, which can be dangerous certain times of the year. I pulled over anyway, much to the relief of the car that was following me and probably wondering why I was going so slow, and saw that there was no broken path through the several feet of snow up the logging road. I hoped for a stable snowbridge across the Downes and drove back to the Downes Brook Trail parking area. Thankfully the parking area was nicely plowed, but there were two cars already parked there. I had mixed feelings about this. On the one hand, I would love to have the mountain to myself. On the other, I would be glad to have a nice broken and packed trail ahead if me. It turned out that I got my way. While I was strapping on my snowshoes a group showed up at the parking area with a dog and cross-country skis. As I headed across the parking lot to the trail they started their cars and prepared to leave. I passed the iron ranger, the self-service pay station found at most of the National Forest parking lots, and noted the sign over the pay slot. It said that no fees were required for the day in honor of Presidents Day. That was most likely why I would have the mountain to myself, most businesses do not observe Presidents Day. 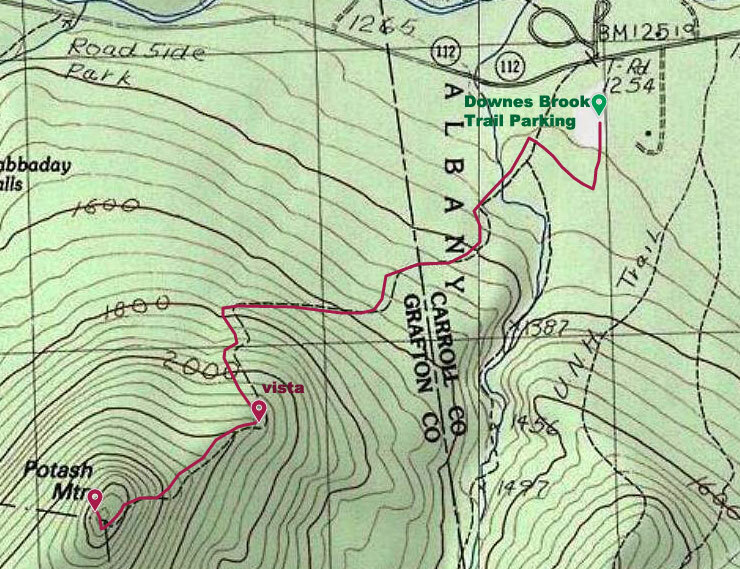 The trail to Downes Brook was easy going and well packed, it meandered through a sparse forest and didn’t gain much elevation. I came to Downes Brook and found it to be bridged over with ice and snow, something that I had read about but had never experienced. I crossed easily and snapped a photo of my first icebridge crossing. The trail gained a little elevation and crossed the logging road where the wind picked up, but I was soon into deeper forest which protected me from the wind. Through the leafless trees I caught glimpses of the view I would have at the summit, I was especially excited to see Carrigain standing proudly on the horizon. The trail came to a switchback and then started to climb more moderately. I had more than enough time for this hike so I took it easy and only took a single break for water (and Nuun, which I also picked up at EMS). When I typically hike on the weekend I can’t get off the island until 8:25am, which gets me to Portland at 9:00am, an hour and a half drive from the White Mountains. Since it was a Monday I could get off the island almost two hours earlier, which gave me plenty of time for a day hike. The trail abruptly broke out of the forest and onto a ledge with an amazing view to the southeast of Mount Chocorua and a more spectacular view to the south of two 4000-footers I hadn’t yet climbed, Mount Passaconaway and Mount Whiteface. Passaconaway was especially beautiful with its great cone towering over the smaller Mount Potash. When the wind gusted, snow would curl off the summit into the indigo sky. I had plans to hike these mountains along with the Tripyramids and Mount Chocorua with some friends this summer, so I had to take a photo to whet their appetites. After the vista the trail continued up to the summit, moderately steep at times but easy for the most part. Since the trail climbed up the south side of the mountain after leaving the trees the path was unhampered by the wind and remained nicely packed all the way to the summit. 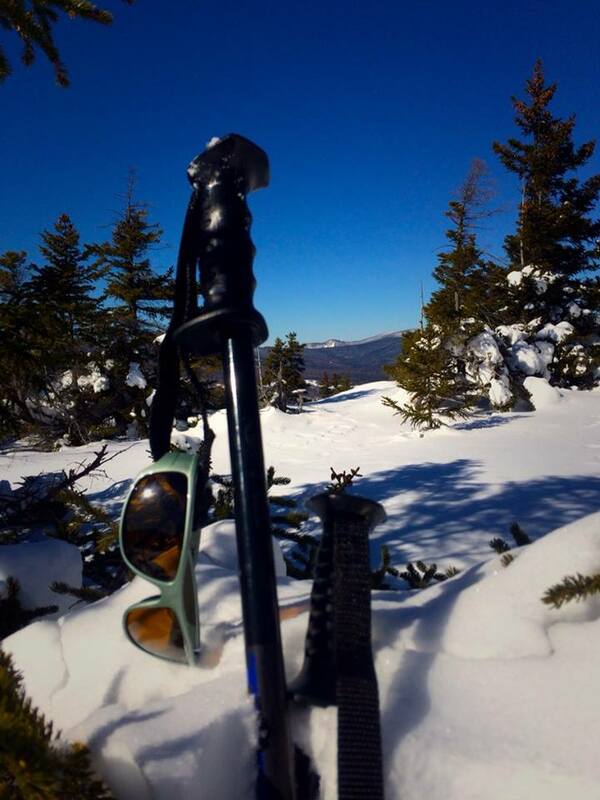 I reached the summit, dropped my gear and unstrapped my snowshoes. The view was absolutely breath-taking. 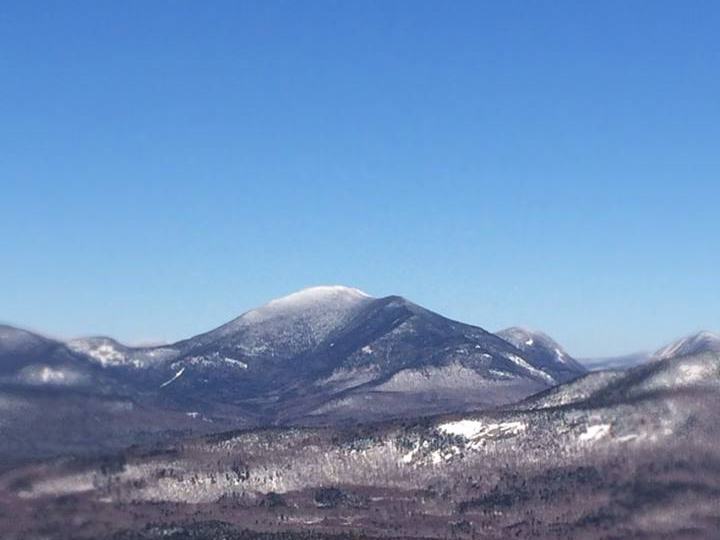 From left to right I could see Passaconaway, Whiteface, The Sleepers, Tripyramids, The Fool Killer, Kancamangus, The Osceolas, Franconia Ridge, The Hancocks, Carrigain, The Willey Range and The Presidentials. There was not a cloud in the sky, the sun was high and warm and I had not seen a single sign of humanity for hours (though I could then see the Kancamangus Highway snaking through the valley below). The only thing that wasn’t perfect was the cold wind from the northeast, but that was bearable considering the rest. I was especially taken by the view of Mount Carrigain which was not only one of my favorite hikes but is probably my favorite mountain to look at from a distance. After eating a wasabi hummus and vegetable sandwich I packed up and headed down the mountain. The hike down was easier than hiking down South Moat Mountain the previous week where I had a hard time navigating the rocky slopes with my snowshoes. I made great time even though I was not hurrying; making it to the parking lot in less than an hour. There were a couple different cars in the parking lot, but there was still nobody in sight. I learned something the previous weekend from hiking South Moat Mountain, it is not fun driving for an hour and a half while wearing a sweaty shirt and socks. I changed into a dry sweatshirt and socks and then began the trek back to Maine. I cranked the music and enjoyed the lulling switchbacks of the Kancamangus Highway. It wasn’t until I got a decent distance back in Maine that I realized I had left my hat, gloves and brand new sunglasses on top of my car while changing clothes. I pulled over and checked the hood, but they were long gone. It was too late to drive back and look for them, but at least I still have this nifty photo of them on Potash Summit. Appalachian Mountain Club. White Mountain Guide: 28th Edition. Boston: Appalachian Mountain Club Books, 2007. Print. 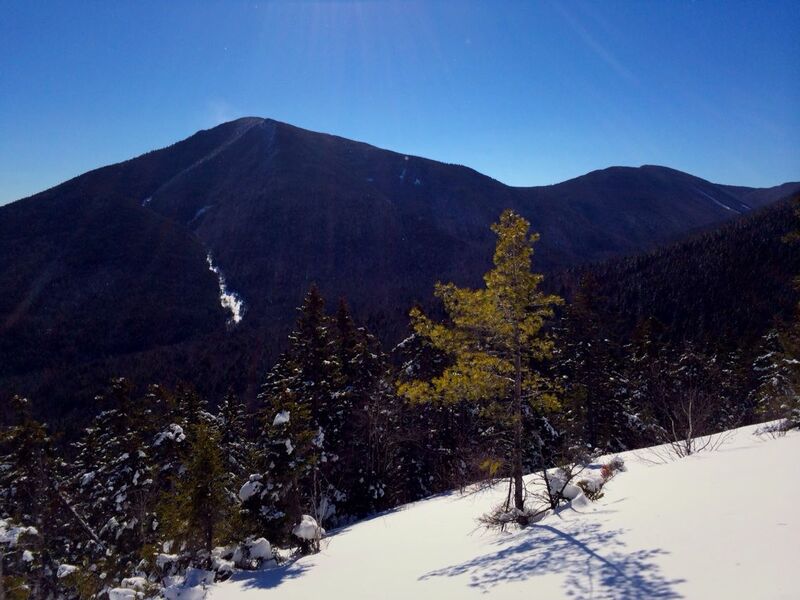 This entry was posted in Hike and tagged Hike, Kancamangus, Maine, New Hampshire, Potash Mountain, snowshoe, White Mountains, winter. Bookmark the permalink.